FILE - A Russian Su-25 jets takes off for a mission from Hemeimeem airbase in Syria, October 22, 2015. The head of Russia's air force said Thursday the military has sent anti-aircraft missiles to Syria in order to protect the Russian planes that have been conducting airstrikes there since the end of September. Col. Gen. Viktor Bondarev said in an interview with the Komsomolskaya Pravda newspaper that the Russian jets were at risk of being attacked or hijacked during their missions. Russia's air campaign has come under scrutiny by others operating in the region, particularly the United States, which has been leading a coalition of countries bombing Islamic State militant targets for more than a year. Top U.S. diplomats said Wednesday that 85 to 90 percent of Russian airstrikes in Syria have hit moderate Syrian rebels and not the Islamic State group. Assistant Secretaries of State Anne Patterson and Victoria Nuland gave that assessment in testimony before the House Foreign Affairs Committee. 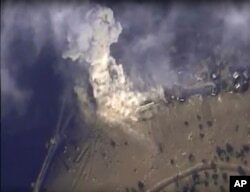 This photo made from footage taken from the Russian Defense Ministry official website on Nov. 2, 2015, shows a Russian airstrike hit a target in Syria. Separately, U.S. Defense Department spokesman Colonel Steve Warren told reporters that less than 10 percent of Russian airstrikes in Syria are targeting the Islamic State group. "And oh, by the way, a majority of their strikes have been using 'dumb' bombs... very unsophisticated," Warren said Wednesday. Russian diplomats and military officials contend the air attacks are aimed at Islamic State extremists. But that claim is widely disputed by the U.S. and others who say the Russians have too often bombed Syrian opposition fighters who have no connection with, or allegiance to, the Islamic State militants. During Wednesday's hearing, committee chairman Ed Royce said Russia is taking a "decisive role in shaping Syria's future, and not in a helpful way." Nuland said Russia is paying a "steep price for its intervention to prop up" the government of Syrian President Bashar al-Assad. She noted that Russia is spending $2 million to $4 million a day to carry out its military efforts in Syria. "If Russia chooses this over the welfare of its own people, they could sustain this for some time," Nuland said. Earlier Wednesday, Russian Foreign Minister Sergei Lavrov highlighted the need to decide which of the various opposition groups fighting in Syria should be a part of future peace talks and which should be considered terrorists. 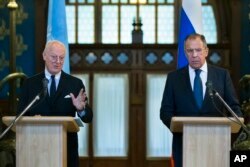 Lavrov spoke at a news conference after meeting in Moscow with U.N. envoy for Syria Staffan de Mistura to discuss the process of finding a political solution to the conflict that has left more than 240,000 people dead since March 2011.